Great series Brian! So glad you wrote this up and shared your experience. I’m still in the process of figuring out exactly how I’m going to go about it, but I was close to lost before this series. Thanks again! Thank YOU! You’re actually the one who inspired the whole discussion. I wish you the best of luck with choosing your path for print making. Just remember — there’s really no right or wrong, just produce work at top quality and you’ll be fine. A fantastic series of articles Brian. I’ll have to spend some more time reading through each time. The framing part is the biggest hassle IMO hence why I don’t offer that service. Great series of posts. I haven’t had a chance to comment on each of them, but I’ve read them all. I had commented on the “pre-series” post, when you said you would be doing these topics, about having trouble deciding how to go about framing/matting/signing my prints to sell or enter into an art show. I’ve been working on getting everything done, and am glad to say that with some of the advice on here, and a lot of reading on APUG, photo.net, and other sites, I’ve finally got everything ready to go and get the final product done. Hopefully within the next week or two I’ll be set up at my local farmers market to try to sell some prints and get a real taste of how hard this business will be. I enjoyed these posts so much, and shared them with a couple of photographer friends. I also printed each one so I can keep them in my notebook for reference. Thank you so much for all of your input! GReat series Brian, but you forgot the most important part… How to make lots and lots of money!!! When will that article come out? 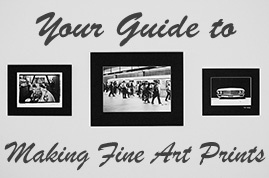 my question is, how do you price fine art photos? I’m new to this and have only sold a few prints at fund raising auctions. I was asked the value. How do you assign value to a photo? That’s a tough one indeed! Part of the cost to the customer will be time and materials. How much did you spend on the piece and how much is your time worth? The rest of the cost is basically a guessing game based on how well-known you are, the scarcity of the piece, and how “good” the artwork is to the public eye. I can’t give any hard-set guidelines on this topic, but here’s what I see happening most of the time. Absolute beginners will charge in the ballpark of $100-$300 for signed/limited work. Those with some sort of reputation will charge between $500-$1000 for signed/limited work. And if you’re making a consistent number of sales and/or getting your stuff shown at high-end galleries… well, the sky is the limit. Anybody else have some ideas on how to approach this subject?